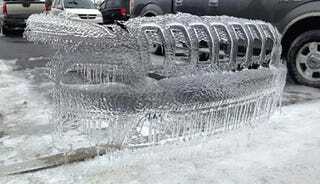 NBC affiliate WITN has published these two photos of a frozen sculpture created by the front of a Jeep, left standing on a curb near Vidant, a hospital in Greenville, North Carolina. Can this be really possible or is it an elaborated 3D render hoax? According to WITN, they "received two different photos from viewers, one picture taken from the front and another looking the other direction." One of the photo-takers' theory is that the Jeep owner left their vehicle running, warming up the engine. The imprint was then left after they backed out of the parking space. The ice was attached to the curb.